Hadfield Cawkwell Davidson have gained a strong working relationship with Swedish Company, IKEA, who have retained the Practice to provide architectural expertise on several new projects around the country including the 37,000m2 store being constructed adjacent to the famous Tinsley Viaduct at the Eastern edge of Sheffield near the Meadowhall Shopping Centre. Concerns over vehicular congestion meant that Traffic & Air Quality studies and solutions were developed and examined extremely closely in conjunction with the Planning Authority to ensure that the store will benefit the community with minimal negative impact. Complexities with site levels has meant that the store may be accessed on foot from Sheffield Road yet main access from the car park is one level up over 1000 undercroft parking spaces. The IKEA Store provides the exciting opportunity to link Sheffield Road with Sheffield and Tinsley canal tow path. The external appearance of the store uses the Internationally recognised IKEA brand components known as ‘Trade Dress’ in conjunction with landscape elements that deal with the site conditions to create a satisfying overall composition. 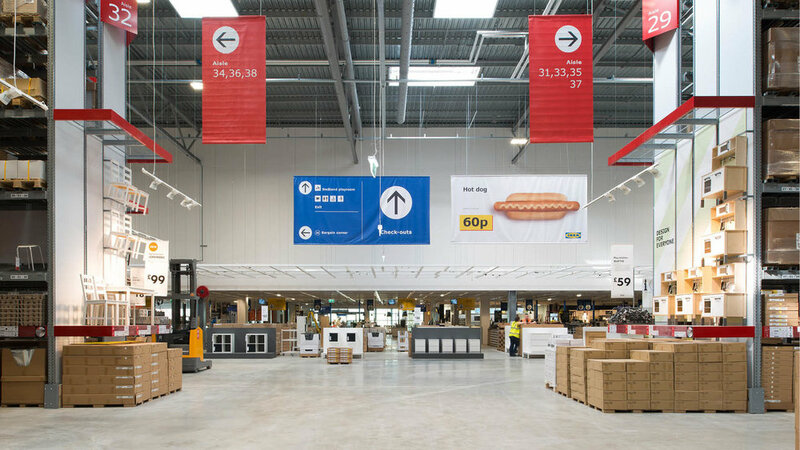 Internally the Store incorporates the 13 components that make up an IKEA Store which have been developed and refined over many decades. The store is now open to the public.